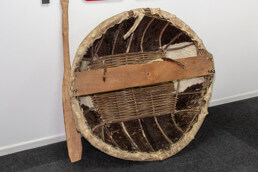 Ironbridge Coracle Trust need help to create a unique museum piece. The 3D Measurement Company (T3DMC) in Bridgnorth, Shropshire have been approached by the Ironbridge Coracle Trust to help with a unique opportunity to help preserve one of the oldest river transport methods in existence. This is an important heritage project which has seen the Coracle Trust granted £76,000 by the Heritage Lottery Fund to rebuild the coracle shed and commemorate the life and work of river men. 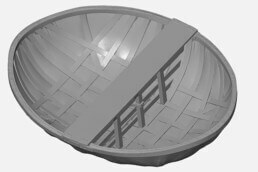 The aim of this project is to recreate a coracle as an exhibit in this new museum where visitors can sit in the replica vessel. 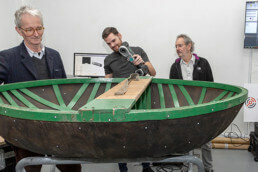 Handheld Laser scanners are used to generate a 3D scan of the coracle. 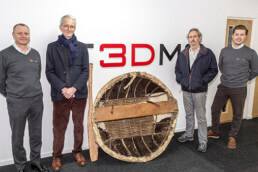 T3DMC have used the latest technology in 3D laser scanning to help recreate ancient boat building craft by using reverse engineering – a 3D scan is taken of an existing coracle to capture the precise dimensions of the boat. This data with then be fed into a 3D printer to create an exact replica of the original. This technique is regularly used in the manufacturing industry where drawings have been lost or parts such as tooling have been manually modified or worn over time. 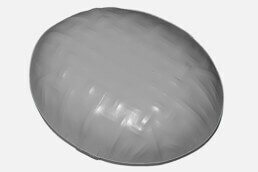 3D scanning is now used extensively in these instances as you can capture a 3D image of the original part to very high accuracy enabling a 3D CAD (Computer Aided Design) model to be created. The 3D CAD is used to support the re-manufacture of the original part, using either advanced machining processes, the latest 3D printing, or additive manufacturing techniques. Who are The 3D Measurement Company? T3DMC was formed in 2013 in a high technology 3D scanning facility in Bridgnorth, Shropshire, and is now home to the largest open-source, automated, optical scanning facility in the UK, capable of handling parts up to 3m in diameter and 2 tonnes in weight. More recently, T3DMC have added a portfolio of handheld 3D laser scanning equipment to the business in order to further grow their 3D scanning service and product offer. The launch of these products was met with considerable interest at the recent Advanced Engineering 2018 exhibition held at the NEC in Birmingham (31 Oct – 1 Nov). 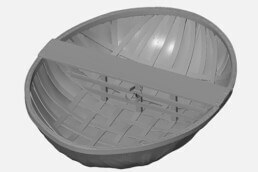 The output from the scan is a computer file containing the exact measurements of the coracle in 3 dimensions and it will include every feature of every surface of the coracle to make sure the printed version is an exact replica. The finished result will be very durable and ideal for visitors to climb into, to get an idea of the skill required to balance and steer such an ancient craft. Watch the video below which showcases the capabilities of our handheld 3D scanner on this project.